It’s fair to say that Dungeons & Dragons has seen a strong revival the past several years. Tabletop roleplaying games are the one part of geek culture that seemed to lag behind the rise of comic book films, gaming, convention culture and the rest. But no more. Pathfinder, Warhammer, Shadowrun, Call of Cthulhu, the World of Darkness — all of these games have seen a return to prominence as tabletop role-playing has finally caught up with the pack. And perhaps nowhere is that clearer than the grand-daddy of all roleplaying games. The advent of Dungeons & Dragons Fifth Edition has been a major boon for the most iconic of all narrative storytelling games. With streaming shows like Critical Role turning the game into a spectator experience and Fifth Edition providing perhaps the best system yet for the game, there’s never been an easier time for new players to join old at the table. Everyone has their favorite D&D setting. Some love the expansive world of Faerun (aka the Forgotten Realms), D&D’s default setting. Others prefer more far-out settings like the wastelands of Dark Sun or the space-faring excitement of Starjammer. For many — including yours truly — it’s Eberron. Keith Baker’s setting, introduced in third edition, was like nothing else D&D gamers had seen up to that point. Here was a setting that was thoroughly D&D-style fantasy, but set in a world where magic had hit an Industrial Era-level of efficiency. The pulp adventure, noir-style stories of a world just coming out of its own sort of world war was populated with the usual races, but tweaked in fascinating ways. It’s long been one of my favorite places to tell epic stories at the RPG table. There had been rumors since the launch of Fifth Edition in 2014 that Eberron would be making its return. And sure, it took a while. But late last summer, Wizards of the Coast announced that the setting would be making it much-anticipated debut in 5E. The Wayfinder’s Guide to Eberron was released, written by Baker in conjunction with Wizards. Since its release, the Wayfinder’s Guide has become one of the most popular supplements — despite sitting in a unique position of not quite being 100% official yet. (It’s a living document still awaiting things like the Artificer class.) I was very fortunate to have the opportunity to speak with Baker late last year at Rose City Comic-Con in Portland about bringing Eberron into Fifth Edition, the future of the setting and more. 411: It’s fair to say that Eberron was one of the more in-demand settings to make a return once Fifth Edition came out, and it’s something that you had expressed an interest in doing. When you went about doing so, what did you find was the easiest to transition over and was there anything which proved notably challenging for you do convert? Baker: I think one of the more challenging parts — that I mean, was fun to work on — was the Dragonmarks. In Third Edition, Dragonmarks were represented by Feat chains, while in Fifth Edition Feats are rarer to begin with. In Third Edition, everyone got a Feat at first level and now in Fifth, you don’t get them until fourth and they have a more significant cost because you’re giving up an ability increase. So they didn’t work as Feats. Backgrounds was another option, but Backgrounds don’t really provide you with a concrete benefit. And so, it was trying to capture the idea of the Dragonmark without sort of just following the path we used in Third, and so we ended up doing it as a sub-race option, essentially. And I’m really happy with how that turned out, but I’m just saying that was definitely — that took a lot of thought and trying a number of different things before we settled on that path. The Warforged were certainly somewhat tricky, but not really, you know. The issues of races is not different, where again with the Dragonmarks we really had to find a different path than we’d done before. 411: I know that the Wayfinder’s Guide is based on how you ran Fifth Edition Eberron in your own games. Was there anything in particular you ended up changing from your own table to the official book beyond the sort of tweaks and the like that just come with putting it out through Wizards of the Coast? Baker: Not really. The main thing is, the races in particular did go through little sort of tweaks as they went into the Unearthed Arcana so there’s a couple sort of things that were added in a little late in the game that aren’t how I played with things. But they’re little things. And beyond that, certainly in terms of the overall image of Eberron, no nothing has changed. With most of Wayfinder’s Guide, the only thing that Wizards really put any oversight into was, as I said, some of the mechanics of the races. So they weren’t telling me what I could and couldn’t do. 411: One of the things I think that appeals to so many people about Eberron is that it has, in terms of Dungeons & Dragons settings, a realistic treatment of people, such as for example, the alignment being less restrictive on races. By the same token, from the get-go it has seemed very forward-thinking in terms of things like gender identity with Kalashtar, Warforged and Changelings in particular. At my table, its been something that I think a couple of players in particular have really appreciated, because it’s not really a writ part of many other settings. Was that something that was a conscious choice, or did it just develop naturally from the races as you envisioned them? Baker: I would say more that it developed naturally. It’s more something that, a big thing to me in trying to create fantasy worlds is trying to make worlds that feel real. And that means, you know, we say that there’s a place for everything in Eberron. One of the points in our approach to religion is actually wanting people to have room to think about faith and what that means. And to me, it’s the same way when it comes to gender identity, sexuality, that this is a world where you can explore or consider all the things that have meaning in our lives. And so, again, I think it is interesting that when you look to the new races. Changelings are very much fluid in identity and to me, in playing Changelings, I really want to think about what does identity even mean to me, and how is my personal interpretation of that? Warforged, it is entirely — you have to decide, who are you? And then the Kalashtar, there is that point that you are not alone. You literally do have another spirit that you are working with. What does that mean for you? I would say that another group is the Valenar elves. One of the things is we really come up — and I’ve had a number of people who have explored this idea of, “I’m trying to emulate my patron ancestor.” What if the patron ancestor is someone very different from me? How do I do that, how do I explore that? And what does that mean for me? And so as I’m saying, in spite of the fact that, you know, three of our four races really have interesting things to explore there, really to me, that was just sort of part of what came out of creating new things. So I’m very happy about that, but I can’t say it was from the start, a perfectly-planned scheme. 411: I know you’ve talked about stuff that you’re planning to do in the future and things that you want to explore. What is your favorite part of the physical setting that you feel hasn’t been explored to the depth that you really want it to be? Baker: Oh, there’s so many things. I mean, one of the things, you’re speaking to the physical, obviously there’s the Planes. But they’re kind of metaphysical. But I really want to explore the Planes, and I have for fourteen years. 411: As a DM, I would love that. Baker: And as I say, one of the things I would love to explore is not just going there, but like the ways in which they influence the world — Manifest Zones, coterminous zones that — it doesn’t matter what level your characters are, there are ways that the Planes can play into a game. But on a more concrete level, I mean, one thing for example is Droaam, which is the kingdom of monsters, or the goblins. Both of those are things that we approach in a very different way. And you know, part of that again comes back to identity: the whole of saying, “Things that D&D traditionally considers monsters, they don’t consider themselves to be monsters.” What is their nation like? How did they view life? What are their values? And you know, just sort of exploring something that’s not always explored in a thoughtful way. And so, Droaam is one of my favorite locations in Eberron. And probably my favorite of the novels I’ve written, The Queen of Stone, is set there in part because I really like thinking about the things D&D has traditionally considered monsters in a different light. 411: Eberron is rare among D&D settings in that the official metaplot doesn’t move forward, which is amazingly freeing as a DM because you have the option to decide all these things for yourself. But by the same token, it can also be intimidating for DMs coming into the setting, particularly when they try to factor in all of the setting’s differences from places like Faerun or Greyhawk. What advice do you have for people who want to run Eberron games but find it all just a lot to take in? The same thing applies chronologically. If you look in the Wayfinder’s Guide, part of the point is we have three of what I call starting points in there, which are specifically in Sharn, that are specifically saying, “Here’s an idea for a swashbuckling action campaign.” “Here’s an idea for a gritty street-level campaign. “Here’s a sort of wacky, ‘We’re going to be an adventurer university’ campaign.” And with any of those three, it’s saying, “These are the perameters.” We’re not trying to do everything, but we’re trying to tell this kind of story. Start with that core, and with all three of those, part of the point is that it geographically centers those. You’re from this neighborhood, or you’re part of this adventurer’s guild, and here’s that district. So that you have a concrete, grounded — “Okay, my character is someone who would hang out at this place. Who would that be?” We have a clear motivation — “We are adventuers, off to adventure in the world.” Or, “We are ground-down people at the bottom of the towers trying to find a way to survive.” And having something that is — think of it almost like you’re writing a novel or creating a movie. You aren’t going to tell every possible story in one movie. So what is the story you are trying to tell? 411: That actually gets into one of my personal favorite parts of Eberron, which is the noir elements. One of the hallmarks of noir is very layered and complex villains, and Eberron has its share of great ones — Erandis Vol, the Lord of Blades, Kaius and so on. I know it’s hard and probably impossible to pick favorite creations, but do you have a favorite Eberron villain? Baker: It’s kind of hard to say, because as you say, I made many of these people. I like them all! And it’s the same way, honestly, in writing the Wayfinder’s Guide, there’s a lot of points where I’m writing different character ideas, where I’m like, “Ooh! I want to play that! Oh no, I want to play that one!” So I mean, I like — Erandis versus the Lord of Blades, I like them because they are telling different stories. And so it sort of depends on the mood that I’m in. If I had to choose just a personal, you know, “I’m going to be poisoned and I have to answer within thirty seconds to get the antidote,” I would actually saw the Daughters of Sora Kell. I’m a big mythology and folklore fan. And what I like about the Daughters is this…they are very in the public eye. It’s not like Erandis, where technically nobody knows that Erandis is out there. The Daughters are in the public eye. And that part of their story is they are literally childhood faerie tales that have just decided that, “Now we’re going to start running a country.” As someone who is a big fan of fairy tales, folklore, I sort of enjoy the, “Baba Yaga decided to make a kingdom of monsters, and what’s that look like?” And it’s something I had fun with in the Queen of Stone novel. When I interacted with them, I do try to remind people, I do try to remind people, “No, your mom probably told you scary stories about her when you were a kid. And now she’s out here doing a thing with an army of trolls.” And that’s sort of fun to explore. 411: Exactly! Certainly not worse than what whoever did to cause the Mournland. Baker: Exactly! So yeah. And it’s also the case that with the Daughters, of course, what you’re really dealing with is three because Katra, Maenya, and Teraza are very different flavor and I like all of them. But I really always think of them together. 411: You said that you have future plans to write more stuff, and I imagine this would be difficult to say for sure depending on what Wizards’ plans are. But is that more likely to end up on the DMs Guild or is there a chance that some of that might end up in official books or on D&D Beyond? Baker: It’s my hope that there will be an official book at some point. The things I want to write — there is a reason that The Planes of Eberron has not come out in fourteen years. And some of the things I want to write, I think are really interesting, I think Eberron fans will think are really interesting, but are a narrower focus. And when you’re doing print books, especially on the scope that Wizards is, they need to try and find the thing that will interest the most people. So what I am glad about with the DMs Guild is that it is an opportunity. It’s an outlet for those things that would never be popular enough to justify a print run. So yeah, of these things that we’ve just talked about…if a new Eberron book comes out, may some of those ideas work into it? Sure. But like I said, I don’t see Wizards ever putting out a hardcover Planes of Eberron book. 411: So finally, in addition to creating Eberron, you’re also the creator of the card game Gloom, which is one of my favorite tabletop games. 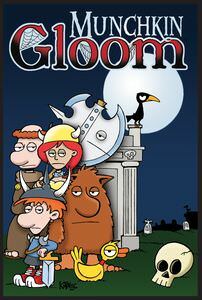 411: So, I have to ask, has there ever been any thought toward or talk of making an Eberron version of Gloom? Because I would really like to kill Merrix d’Cannith after he became Worried by Warforged. Baker: Nope. Because different companies, it’s all about the licensing. And I mean, it’s not even like it’s up to WotC [Wizards of the Coast]. It’s Hasbro beyond that, you know. They don’t have full control over their destiny. As I’ve said, I would love to play the Lords of Sharn version of Lords of Waterdeep. 411: The Fiasco playset you mentioned [in the Eberron panel at Rose City Comic Con], we must have that! Baker: I want to do it! I love Droaam. But no, to me that, comes to, you know…certainly Munchkin Gloom, some of what I put in there, there is actually essentially a warforged cleric. Some of what I put in there was trying to put in a generic, “This is actually D&D Gloom, in a way.” I wish it could, but if it is, it would just be something I made myself. 411: Fair enough. Thank you! WWE News: Eric Young Comments on Move to Raw, Bonus Scene From This Week’s Miz & Mrs.